Mountain Home, AR (February 4, 2019) –- Bass Cat Boats is pleased to announce that its 32nd Annual Owner’s Invitational will take place on April 25 – 27 at Beaver Lake in North West Arkansas. The 2019 Bass Cat Owners Invitational will be hosted by the Rogers - Lowell Chamber of Commerce along with the Beaver Lake USACE. Long time sponsors Minn Kota, Humminbird, Mercury, Strike King, Lew’s and many others will also support this year’s event. Registration will open at the end of February. It costs $150 to enter and compete at this year’s Owner’s Invitational. 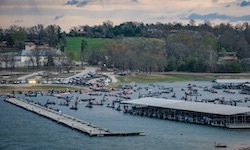 More information on the 32ndAnnual Owner’s Invitational will be released soon on Bass Cat’s website, www.basscat.com.